Grand Canyon, AZ â€” In defiance of legal challenges and a U.S. Government moratorium, Canadian company Denison Mines has started mining uranium on the north rim of the Grand Canyon. According to the Arizona Daily Sun the mine has been operating since December 2009. Denison plans on extracting 335 tons of uranium ore per day out of the â€œArizona 1 Mineâ€, which is set to operate four days per week. The hazardous ore will be hauled by truck more than 300 miles through towns and communities to the companyâ€™s White Mesa mill located near Blanding, Utah. After being pressured by environmental groups, U.S. Secretary of Interior Ken Salazar initially called for a two-year moratorium on new mining claims in a buffer zone of 1 million acres around Grand Canyon National Park, but the moratorium doesnâ€™t include existing claims such as Denisonâ€™s. The moratorium also doesnâ€™t address mining claims outside of the buffer zone. The Grand Canyon is ancestral homeland to the Havasupai and Hualapai Nations. Although both Indigenous Nations have banned uranium mining on their reservations the U.S. Forest Service and Bureau of Land Management may permit thousands of mining claims on surrounding lands. Due to recent increases in the price of uranium and the push for nuclear power nearly 8,000 new mining claims now threaten Northern Arizona. Uranium mined from the Southwestern U.S. is predominately purchased by countries such as France (Areva) & Korea for nuclear energy. In July of 2009 members of the Havasupai Nation and their allies gathered for four days on the South Rim of the Grand Canyon at their sacred site Red Butte to address the renewed threat. Red Butte has long been endangered by the on-going threat of uranium mining. Under an anachronistic 1872 mining law, created when pick axes and shovels were used, mining companies freely file claims on public lands. The law permits mining regardless of cultural impacts. Currently there are 104 nuclear reactors in the United States which supply 20% of the U.S.â€™s electricity. In January the Obama administration approved a $54 billion dollar taxpayer loan in a guarantee program for new nuclear reactor construction, three times what Bush previously promised in 2005. Since 2007, seventeen companies have now sought government approval for 26 more reactors with plans to complete four by 2018 and up to eight by 2020. New reactors are estimated to cost more than $12 billion each. Although nuclear energy is hailed by some as a solution to the current U.S. energy crisis and global warming, those more closely impacted by uranium mining and transportation recognize the severity of the threat. Uranium is a known cause of cancers, organ damage, miscarriages & birth defects. Drilling for the radioactive material has been found to contaminate underground aquifers that drain into the Colorado River, and sacred springs that have sustained Indigenous Peoples in the region. In addition, surface water can flow into drill holes and mine shafts which can also poison underground water sources. Emerging in the Rocky Mountains in North Central Colorado and winding 1,450 miles to the Gulf of California, the Colorado River is held sacred by more than 34 Indigenous Nations. The Colorado also provides drinking water for up to 27 million people in seven states throughout the Southwest. The river that carves the Grand Canyon has been extensively used by the agricultural industry and cities that are dependent for drinking water, so much so that it now ceases to flow to the Gulf of California, forcing members of the Cocopah Nation (The People of the River) in Northern Mexico to abandon their homelands and relocate elsewhere. Flocks of sheep and other livestock still graze among radioactive tailing piles and ingest radioactive water. 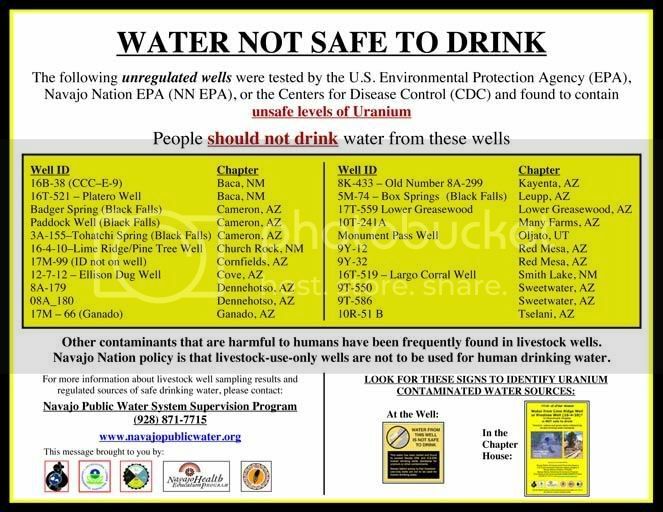 According to the Navajo Nation up to 2.5 million gallons of uranium contaminated water is leaching out of the Shiprock Uranium Mill near Shiprock, New Mexico into the San Juan River every year. At the Church Rock Mine in New Mexico, which is now attempting to re-open, up to 875,000 cubic yards of radioactive waste continue to contaminate the land. In July 1979 a dirt dam breached on the Navajo Nation at a uranium processing plant releasing more than 1,100 tons of radioactive waste and nearly 100 million gallons of contaminated fluid into the Rio Puerco (which ultimately flows into the Colorado River) near Church Rock, NM. This was the single largest nuclear accident in US history. Thousands of DinÃ© families that live in the region, including those forced to relocate from the Joint Use Area due to coal mining, continue to suffer health impacts resulting from the spill. In 2005 the DinÃ© Nation government banned uranium mining and processing within its borders due to uraniumâ€™s harmful legacy of severe health impacts and poisoning of the environment. And yet, high cancer rates, birth defects and other health impacts still bear out the uranium industryâ€™s dangerous legacy. Today the US has nearly 60,000 tons of highly radioactive spent nuclear waste stored in concrete dams at nuclear power plants throughout the country. The waste increases at a rate of 2,000 tons per year. 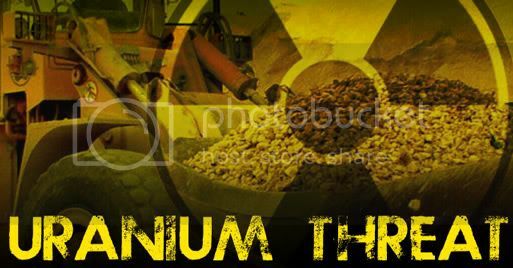 Depleted Uranium (DU) is a byproduct of uranium enrichment and reprocessing which has controversial military uses including armor piercing projectiles. DU has been found to cause long-term health effects ranging from harming organs to causing miscarriages and birth defects. In 1987 Congress initiated a controversial project to transport and store almost all of the U.S.â€™s toxic waste at Yucca Mountain located about 100 miles northwest of Las Vegas, Nevada. Yucca Mountain has been held holy to the Paiute and Western Shoshone Nations since time immemorial. In February 2009 Obama met a campaign promise to cut funding for the multibillion dollar Yucca Mountain Nuclear Waste Repository project. The controversial project was initially proposed in 1987 with radioactive waste to be shipped from all over the U.S. via rails and highways. Currently a new proposal for an experimental method of extracting additional fuel from nuclear waste called â€œreprocessingâ€ renews the threat to desecrate the sacred mountain on Western Shoshone lands. Western Shoshone lands, which have never been ceeded to the U.S. government, have long been under attack by the military and nuclear industry. Between 1951 and 1992 more than 1,000 nuclear bombs have been detonated above and below the surface at an area called the Nevada Test Site on Western Shoshone lands which make it one of the most bombed nations on earth. Communities in areas around the test site faced exposure to radioactive fallout which has caused cancers, leukemia & other illnesses. Western Shoshone spiritual practitioner Corbin Harney, who has since passed on, helped initiate a grassroots effort to shutdown the test site and abolish nuclear weapons. Indigenous Peoples in the Marshall Islands have also faced serious impacts due to U.S. nuclear testing. In her book, Conquest: Sexual Violence & American Indian Genocide, Andrea Smith reports that some Indigenous Peoples in the islands have all together stopped reproducing due to the severity of cancer and birth defects they have faced. In March 1988 more than 8,000 people converged for massive 10 day direct action to â€œreclaimâ€ the test site, nearly 3,000 people were arrested. Groups such as the Nevada Desert Experience (NDE) and Shundahai Network continue their work to shut down the test site and resist the corporate and military nuclear industry. Throughout the 1980â€™s a fierce movement of grassroots resistance and direct action against uranium mining near the Grand Canyon had taken shape, galvanized by the Havasupai, Hopi, DinÃ© (Navajo), Hualapai tribes and a Flagstaff group, Canyon Under Siege. Prayerful and strategic meetings were held once a year throughout the 80s. In 1989 a group known as the â€˜Arizona 5′ were charged for eco-actions including cutting power-lines to the Canyon Uranium Mine. Attributable in some part to the resistance and but mainly to a sharp drop in the price of uranium, companies like Dennison were forced to shut their mines down. Mt. Taylor, located on Forest Service managed lands in New Mexico between Albuquerque and Gallup, has also faced the threat of uranium mining. The mountain sits upon one of the richest reservers of uranium ore in the country, it is held holy by the DinÃ©, Acoma, Laguna, Zuni & Hopi Nations. In June 2009 Indigenous Nations and environmental groups unified to protect the holy Mountain and through their efforts Mt. Taylor was given temporary protection as a Traditional Cultural Property. For 7 years Indigenous People from throughout the world have gathered to organize against the nuclear industry at the Southwest Indigenous Uranium Forum on the Acoma Nation. Klee Benally (DinÃ©) is a collective member of Indigenous Action Media, on the Board of Directors of the Shundahai Network, and is a musician with the group Blackfire. Author Mary Sojourner assisted editing this article.